We had the pleasure of meeting this Awesome Kid in Central Park this holiday weekend. Shun is a self-taught one man circus act. 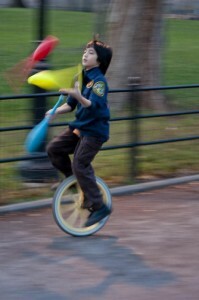 He juggles, rides a unicycle, plays the conga, and has the sweetest demeanor of any 9 year old we have ever met. He will be performing at Madison Square Garden this week at the Knicks game! This entry was posted in Uncategorized and tagged Awesome, Epitome.